On August 24th, 2016 a tremendous earthquake devastated Central Italy. As everyone know, the consequences were huge: 300 victims and more than 2500 displaced. Houses, historical buildings, churches, roads have been partially damaged or completely destroyed. Many people have been left homeless and many structures have been found inadequate in the face of this catastrophe. Rescue teams were immediately deployed to bring assistance to the afflicted populations: civil protection, caritas, red cross and fire fighters worked uninterruptedly to help the victims and to give them a hand during the first post-earthquake period. Many emergency structures were erected to provide temporary hospitality, supplied with kitchens, bathrooms and beds inserted inside tents and temporary containers, to provide some form of normality in the day to day lives of those afflicted by the earthquake. Winters in Central Italy are very harsh, and conditions such as extreme cold, humidity in the air or on materials, can have a negative effect on the comfort levels of the residents, in addition to endangering the equipment and the structure itself. 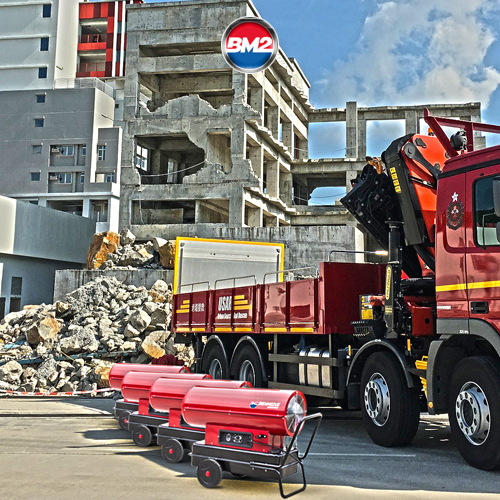 Biememdue gave its support in resolving this type of problem and in helping the afflicted populations, by sending their warm air generators JUMBO and EC to provide heating for the residents and rescue teams. More than one year after this immense tragedy which hit Central Italy, Biemmedue continues to provide support with its own products from the Arcotherm line dedicated to professional heating, so that the afflicted populations will not be left in the cold, not even in this second winter after the earthquake.